Eventide is no stranger to strange effects. From compact pedals to multi-engine rackmount gear, the company has made its mark in the memories of countless musicians, producers, and audio engineers. 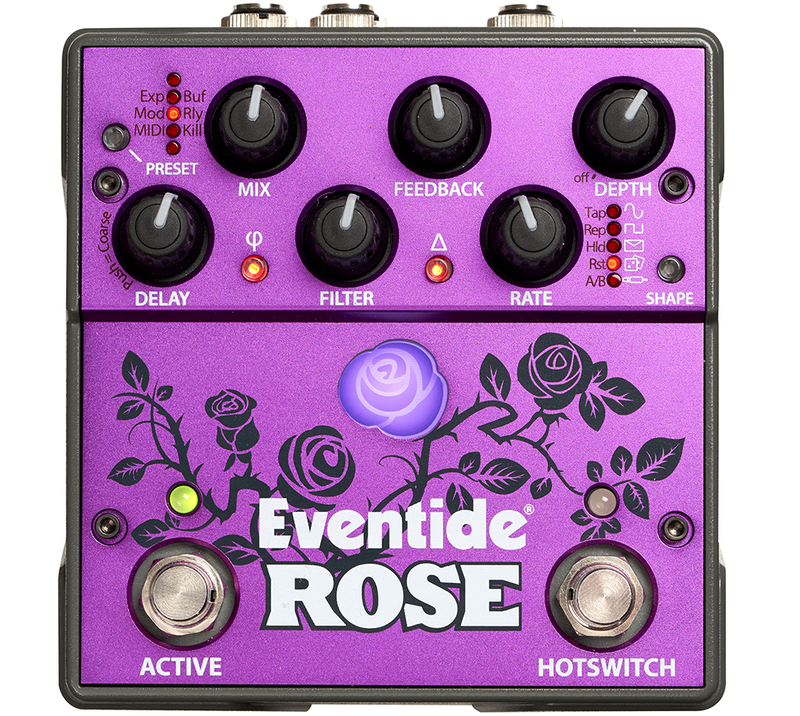 Unsurprisingly, Eventide ignites that familiar feeling of excitement with its new Rose stompbox, a modulated digital delay line surrounded by analog mixing, filtering, and feedback. Guitar and bass players are sure to dig its vibe, and engineers in studio and live stage applications will appreciate its line-level input capability and analog circuitry. Rather than relying on a DSP chip to execute effects processing, the Rose employs a digital delay line (DDL) inspired by the TECnology Hall of Fame inductee Eventide DDL 1745, which revolutionized the world of delay upon its release, in 1971. The Rose's delay comes from a digital clock with a sweep range of approximately 8 to 200 kHz, enabling up to 10 seconds of delay at maximum sonic resolution, or up to 50 seconds of delay at "lo-fi" fidelity. You can set up traditional delay, invert the phase, or even conjure up reverse delay. Analog circuits are responsible for audio manipulation options such as the feedback, mix, and adjustable low-pass filter. You get five modulation sources (e.g. sine wave, square wave, and random), a delay multiplier, and three bypass modes—buffered bypass, relay bypass, and kill input. In addition to the on/off footswitch, the Rose has an assignable Hot switch, which can be set to control the tap tempo, delay repeat, modulation hold, modulation reset, or A/B switching function. 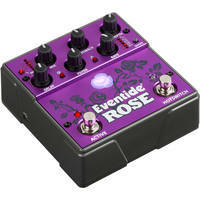 With so many possible configurations, you'll continually thank Eventide for integrating memory with five presets into the Rose. Regarding I/O, the Rose offers the expected 1/4" input and output jacks. However, something unexpected and welcomed is present… a flip switch to select guitar- or line-level input! The 1/4" input marked "Exp Pdl" is deceiving, in the best way. Although you'd assume it's simply an expression pedal input, it can alternatively be used as an aux input or MIDI input. Fancy! Whether you crave the essence of the legendary DDL 1745, or have a muse in need of a new creative spring, the Eventide Rose is worth stopping for. Talk shop at the B&H SuperStore or visit our website to learn more!